on whether to bow to demands from the 9/11 commission to have National Security Advisor Condoleezza Rice testify in public and under oath, reports Chief White House Correspondent John Roberts. Roberts tells CBSNews.com the change in policy is being discussed at the highest levels in the White House. Rice reportedly believes that it might be positive for her to appear. But President Bush makes the final decision, and is thus far against it, says Roberts. The White House is under enormous political and public pressure to waive its claim of so-called "executive privilege." President Bush has vigorously defended his right to receive advice from aides without the threat it will be aired in public. "I think the White House is making a very serious political mistake. In fact, I think they have made a long-term series of mistakes in the way they have handled this commission,'' said member John Lehman. In a 60 Minutes interview aired Sunday, Rice cast herself as ready to testify but restrained by the principle of executive privilege. "Nothing would be better from my point of view, than to be able to testify. I would really like to do that. But there's an important principle involved here,'' Rice said "It is a long-standing principle that sitting National Security Advisors do not testify before the Congress." But after the parade of current and former officials that have gone before the commission, Rice's absence, say former White House officials, is playing as a negative -- creating the perception that she has something to hide. "The longer they refuse to have her testify in public the more suspicion they bring. And frankly the more they string this story out,'' said former White House advisor David Gergen. The White House also faces charges of hypocrisy -- claiming executive privilege -- at the same time it made public confidential e-mails and transcripts of background briefings to discredit chief critic Richard Clarke. Add to that Rice's recent blitz of the public airwaves to state her case -- while stonewalling the commission -- and it appears to some that the White House has badly stumbled. "They're in a hole. First rule of holes is stop digging. Come on out. Just deal with it. The country will welcome her testimony and I frankly think she can bring the country with her. She's very persuasive,'' says Gergen. Former National Security officials -- who themselves fought to preserve executive privilege -- say Rice probably now has no choice. That her recent TV appearances have completely undercut her case for a private session with the commission. The White House performance on 9/11 has been under fire from former counterterrorism adviser Richard Clarke. Clarke was critical of the Bush administration in a newly-released book. Last week, Clarke told the 9/11 commission that the Bush administration did not make fighting al Qaeda an urgent priority before the 2001 attacks and was fixated on Iraq. The White House has denied his allegations. A former top counterterrorism official and Bush administration critic is welcoming a call by Republicans to declassify his earlier testimony to Congress. Republican lawmakers have responded by moving to declassify Clarke's earlier testimony in 2002, hoping to show discrepancies between Clarke's recent attacks on the administration's terrorism policies with flattering statements he made as a White House aide. Clarke said he welcomed such a move, and also suggested they declassify all e-mails, memos and all other correspondence between him and Rice, as well as her private testimony before the commission. Asked about Clarke's request for the declassification, Secretary of State Colin Powell on CBS News' Face the Nation, said, "My bias will be to provide this information in an unclassified manner not only to the commission, but to the American people." White House spokesman Jim Morrell said decisions on declassification "will be made in discussion with the 9/11 commission." Rice, a chief critic of Clarke, has said Clarke praised President Bush's anti-terror efforts while working for the president, but then began telling a different story after leaving his post and writing a book that has become a best seller since going on sale last week. Clarke's criticism cut to the heart of one of the president's reelection campaign themes: his national security credentials, not just before Sept. 11 but also since then, in Iraq and elsewhere. Clarke has suggested the president pressured aides to find an Iraq link to Sept. 11. 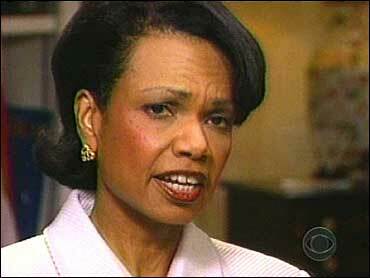 Rice acknowledged Sunday that Mr. Bush asked whether Iraq was involved, but denied he wanted a particular answer. "The president asked a perfectly logical question," Rice said. "This was a country with which we'd been to war a couple of times, that were firing at our airplanes in the no-fly zone. It made perfectly good sense to ask about Iraq." 60 Minutes Correspondent Ed Bradley asked Rice why, according to some reports, there have been more terrorist attacks in the 30 months since Sept. 11 than there were in the 30 months before — despite the war on terror. "We are being attacked by them because they know that we're at war with them. And they're going to continue to attack," Rice said.